If you want to build a society that values sustainable growth and environmental responsibility, the best investment you can make is early education. 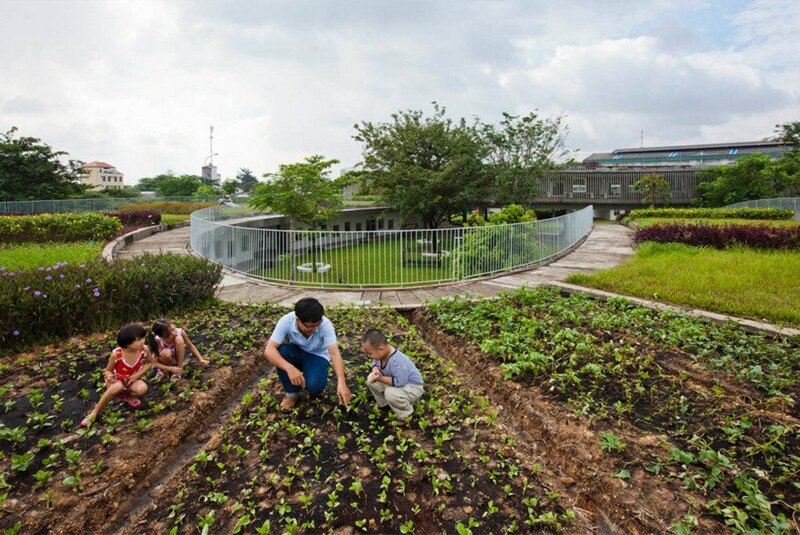 That's the approach Vo Trong Nghia Architects took in designing their recently completed Farming Kindergarten, a sustainable educational space topped with an accessible green roof. Located in Dongnai in southeastern Vietnam, this knot-shaped kindergarten was built with interactive energy-saving features to educate preschoolers on the importance of caring for the environment. Built in a tropical climate, the spiraling green roof can stay lush year round and provides more than enough food for its 500 preschool children. Two sloping ends of the triple ring-shaped structure are neatly tucked beneath a raised loop, landing flush with the three inner courtyards. These internal courtyards offer a protected and comfortable play space for the children. These outdoor play spaces are also extended onto the vegetated roof, which doubles as an outdoor classroom where children can learn how to grow their own food. Beneath the green roof, the classrooms and indoor spaces are shielded from the sun by concrete louvres. Recycled materials, water recycling, solar-powered heating and other energy-efficient and eco-friendly features are visibly designed into the building to teach children about energy saving processes. 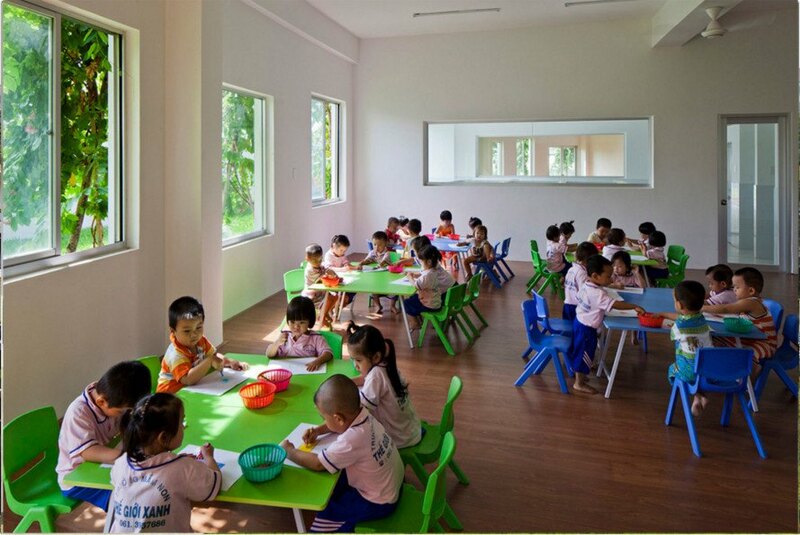 The Farming Kindergarten received a Silver Provisional Certificate as a pilot project of LOTUS, a green rating system by the Vietnam Green Building Council. Very Impressive. Other Nations should aspire to come close; both in terms of funding pre-school and investing in LEEDS certified buildings. Built in a tropical climate, the spiraling green roof can stay lush year round and likely provide more than enough food for its 500 preschool children. Two sloping ends of the triple ring-shaped structure are neatly tucked beneath a raised loop, landing flush with the three inner courtyards. These internal courtyards offer a protected and comfortable play space for the children. 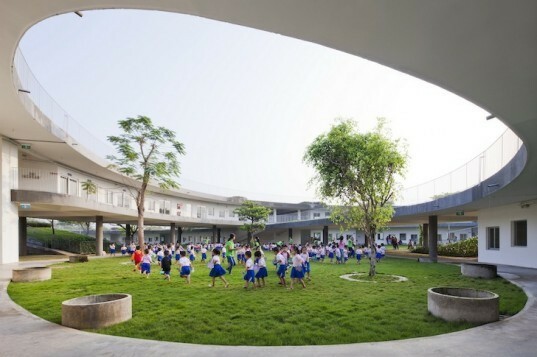 The Farming Kindergarten received a Silver Provisional Certificate as a pilot project of LOTUS, a green rating system by the Vietnam Green Building Council. An early rendering of the Farming Kindergarten.